This time, I have both an album and a book review. 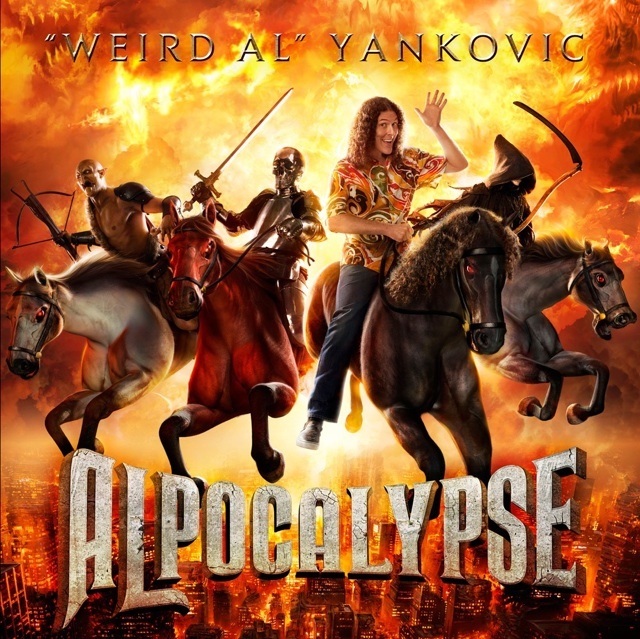 “Weird Al” Yankovic, Alpocalypse – Within the past two decades or so, Weird Al has been releasing albums at a rather slow pace, but there was a particularly long wait for this one. About half of the songs had already been released about two years ago on the Internet, but it’s nice to get them in actual album format. On this new album, Al sticks to his usual formula. Why mess with what works, after all? As with his past few records, there are five parodies of popular songs, six originals (sometimes style parodies and other times original compositions), and one polka medley. Parody targets this time include Lady Gaga’s “Born This Way” (with “Perform This Way”), Taylor Swift’s “You Belong with Me” (“TMZ”), and Miley Cyrus’ “Party in the USA” (“Party in the CIA,” which I’m kind of surprised hasn’t been a joke on American Dad yet). These songs were pop hits you pretty much couldn’t avoid in the past year or so, which are often Al’s best parody fodder. While none of the songs he’s parodied on other albums this decade were obscure, they didn’t strike me as being quite as universal as much of his past work. Perhaps ironically, I think a lot of Al’s fans are too white and nerdy to be all that familiar with the Chamillionaire song “White and Nerdy” was spoofing. Perhaps the funniest parody on the new album, however, is a take on T.I.’s “Whatever You Like” for the ailing economy, featuring lines such as, “Take you out for dinner anywhere that you please, like Burger King or Mickey D’s, and baby, you can have whatever you like. I said you can even have the large fries.” One notable thing about the album is how focused it is on the Internet, which is perhaps inevitable in this day and age. In addition to “TMZ,” there’s the Doors style parody “Craigslist” and the amusing closer “Stop Forwarding That Crap to Me.” And while “CNR” isn’t directly about the Internet, it seems to have been inspired by the memes of Chuck Norris facts, only about Charles Nelson Reilly instead. The polka medley, “Polka Face,” has the same basic idea as the ones on earlier albums, but it’s pretty much impossible for the polkas NOT to be insanely catchy and funny. Changing arrangements can sometimes work just as well, if not better, than changing lyrics. Overall, it’s the same thing Al has been doing for decades (longer than most of the musicians he parodied this time have been alive), but it remains effective. A Mystical Magical Super Adventure in Oz, by Marin Elizabeth Xiques and Chris Dulabone – In an earlier book co-authored by Chris and Rinny, A Silver Elf in Oz, Ozma decides to transport an entire American town to Oz in order to help it overcome its problems. A bit out of character for Ozma, I thought, especially considering her stance at the end of Tik-Tok. Maybe it was some sort of experiment on her part. Regardless, in this book, the inhabitants of the town are adjusting to life in Oz. I find it a bit odd that it doesn’t seem like most of them have ever left their own city; isn’t exploring the first thing most people would do upon arriving in a fantastic fairyland? Anyway, the plot involves the kids of the town and their teacher taking a field trip to the Springbok Forest, setting of Ridiculous Rivals (which I have read) and I Want to Grow Up (which I haven’t). A bratty girl named Delilah Summers seeks to cause trouble for her classmates, and ends up getting a taste of her own medicine from the mischievous skeezique Fwiirp, a veteran of several other apocryphal Oz books. I can tell the authors had fun writing this, especially parts with Delilah facing silly but still dangerous enemies, but I can’t say it was one of my favorites. I think it wasted its potential somewhat, and could probably have used more traditional Oz characters. Still, it was a light and breezy read, and definitely had its merits. This entry was posted in Albums, Book Reviews, Chris Dulabone, Marin Elizabeth Xiques, Music, Oz, Oz Authors and tagged a mystical magical super adventure in oz, a silver elf in oz, alpocalypse, doors, i want to grow up in oz, lady gaga, miley cyrus, ozma, ridiculous rivals in oz, skeeziques, t.i., taylor swift, weird al yankovic. Bookmark the permalink.